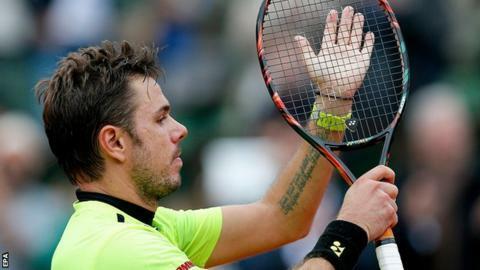 Defending champion Stan Wawrinka beat Viktor Troicki in four sets to reach the last eight of the French Open. The Swiss third seed won 7-6 (7-5) 6-7 (7-9) 6-3 6-2 and will face Spain's Albert Ramos-Vinolas, who knocked out eighth seed Milos Raonic 6-2 6-4 6-4. France's ninth seed Richard Gasquet meets Andy Murray after a 6-4 6-2 4-6 6-2 win over fifth seed Kei Nishikori. Women's fourth seed Garbine Muguruza progressed with a 6-3 6-4 win against 2009 champion Svetlana Kuznetsova. The 22-year-old Spaniard will face American Shelby Rogers next. Wawrinka, 31, remains on course to meet second seed Murray in the semi-finals after his eighth successive win on clay. The two-time Grand Slam champion enjoyed himself on Court Philippe Chatrier, taking part in a mid-match rally with a ball boy and then twirling 360 degrees on court after beating 22nd seed Troicki to take a selfie-video with the 10,000 crowd. Troicki, 30, pushed his opponent hard in the first two sets, but faded in the third as he struggled with a hip injury. As the Serbian had treatment, Wawrinka used the break to entertain the crowd. "I asked the ball boy if he played tennis and I thought, 'why don't we go and hit a few balls'. He wasn't afraid to be on centre court," said Wawrinka. "We had a little chat. He was a nice kid. It was nice for him. It was fun for the audience. I was a little bit bored waiting for Troicki so it kept me busy." After French number one Jo-Wilfried Tsonga pulled out through injury on Saturday, Gasquet was the home crowd's last remaining hope in the singles draw. The 29-year-old had never previously progressed beyond the fourth round at Roland Garros, but eased past Nishikori in a rain-delayed match on Chatrier. Nishikori led 4-2 in the opening set when play was stopped, only for Gasquet - using his superb single-handed backhand to devastating effect - to battle back after the restart. "I was fired up at the restart, I knew I had to match his tempo if I did not want to lose in three sets," said Gasquet. Shelby Rogers, ranked 108th in the world, reached her first Grand Slam quarter-final by beating Romanian 24th seed Irina-Camelia Begu 6-3 6-4. "It's incredible and I'm really happy that it didn't start raining," said Rogers, who broke down in tears after the match. "I always dreamed of this when I was a little girl in Charleston but never really thought I would reach the quarter-finals in Paris." Rogers, 23, has now beaten three seeds in her run at Roland Garros having seen off 17th seed Karolina Pliskova in the first round and 10th seed Petra Kvitova in the last 32. The 28-year-old Ramos-Vinolas, who has never been past the second round in 18 appearances in the four majors, broke Raonic five times and only lost serve once. "I have no words to explain how I feel," said the world number 55. "It was four years in a row losing in the first round." Raonic was watched by seven-time Grand Slam champion John McEnroe, who is joining the 25-year-old Canadian's team ahead of Wimbledon next month. But the world number nine, who already employs 1998 French Open champion Carlos Moya and Riccardo Piatti as full-time coaches, insists he will have the final say on his future direction. "I'm the CEO of the Milos Raonic Tennis," he said. "Every coach I have is to some extent an advisor. I take everybody's consultations very personally. I know everybody I have around me wants to help me to the fullest. "I was sort of just looking for another set of eyes to be a bit more efficient on grass. I'm sure John will have some quality advice to give."